Bullets and tear gas were fired upon Palestinians and internationals whilst they planted olive trees on the land legally owned by the village of Iraq Burin yesterday. 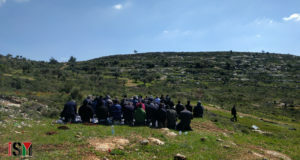 The popular committee asked for a group of internationals to assist them in planting olive trees on the village land which is close to an army out post and the illegal Israeli settlement of Bracha. The trees were successfully planted even under the aggressive presence of the Israeli Army. After some 20 minutes, another jeep turned up, and the heavily armed soldiers started moving towards the people. One of the soldiers was seen aiming his gun directly at one of the boys. When one boy, who in a symbolic act of resistance, threw a stone towards the soldiers in the far distance, they responded by firing shots and tear gas directly at the people, who had to run and duck to avoid being hit. More shots where fired at the youth but it is not clear if they were live or rubber coated steel bullets. However, what was clear was the completely disproportionate use of weapons and force on people partaking in a peaceful act of planting trees. Despite the dangerous aggression of the Israeli army all 50 olive trees were planted on the hillside and three in the local cemetery – one for each of the boys that were killed in the village in the last year. On 19th March 2010, 16-year-old Muhammed Qadus, together with his cousin Asaud Qadus were shot and killed by the Israeli Army during a peaceful demonstration. On the 27th January this year, 19-year-old Oday Maher Hamza Qadous was shot dead by a settler on the hilltop just outside the village.